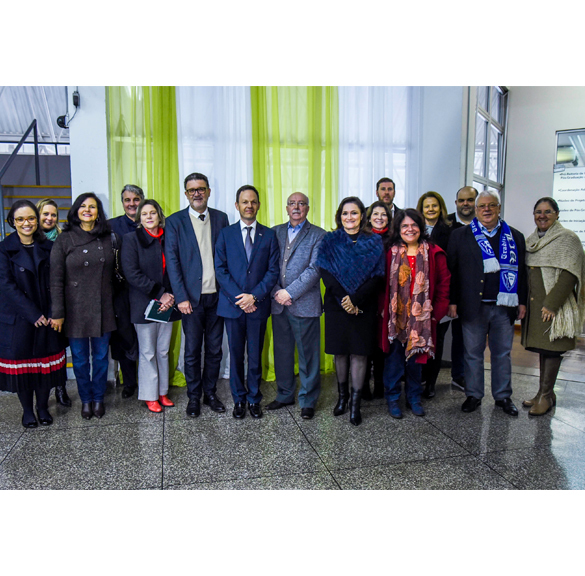 Feevale University's Rector, Cleber Prodanov, and the vice-president of Leiria Polytechnic Institute, Portugal, Nuno Rodrigues, signed the addendum to the specific protocol of the master's degree in Management Control. The agreement regulates the new MBA participation guidelines for Feevale students, as well as to expand cooperation between both institutions. 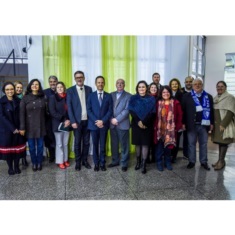 Rodrigues was welcomed by Roberto Cardoso, Aspeur President, by professor Paula Casari Cundari, director of International and Institutional Affairs, as well as directors, coordinators and professors. According to the coordinator of the MBA in Controllership Management and director of the Institute of Human and Social Sciences, Marcelo Ayub, the specialization disciplines are aligned with the Portuguese masters’. "Our course has this partnership with IPL in the double degree, that is, the student concludes studies at Feevale, and has the opportunity to take some credits in Portugal, and also the Master title. It's the MBA here and the MSc in Europe, " he explains. The first student to hold the title will travel to Portugal next October. According to professor Paula Cundari, IPL is a very important partner for the University. "Rodrigues visit to the Institution is to validate the importance of interinstitutional cooperation. The condition that is given to Feevale students is the same as European students have, so it is an opportunity to better qualify education levels and pursue graduate title. For the vice president of IPL, the students who receive the double title will allow the approximation between the two territories and will promote the development of both regions. In addition, he already plans to extend his partnership in several courses, as the Biomedical Engineering, authorized by the Ministry of Education (MEC), last Wednesday, 4th. "In the last ten years we have had a very important approach, which allowed us to realize that we have many points where we can open the doors to new future partnerships, from the area of Management Control to Inclusion, Tourism and Gastronomy. In fact, there is the goal of organizing a joint degree in Biomedical Engineering which is a new area for us and we will certainly have the collaboration of Feevale University to make it even more successful, "Rodrigues said.